Disclaimer: There are no spoilers in this article. Any views or opinions expressed are based solely on where the Game of Thrones TV series currently is and no other knowledge or information is presented in this article. The episode leading up to a season finale is often more significant than the finale itself. Whereas the finale is tasked with the focus of bringing an end to season, the episode prior has the opportunity to still deliver a some poignant messages, before things come to an end in the finale. And in The Watchers on the Wall, the second to last episode of this season, a powerful experience is exactly what we got as we were immersed in the greatest battle scene of Thrones history. So powerful a battle that it commanded every second of the episode, quickly making most of us forget about the extraordinarily heart-wrenching death of Prince Oberyn from last week. But why was this battle so significant that it needed to consume the entire 50-minute episode? For starters, battle scenes are extremely rare in the Thrones world. Although battle may always seem present and the prospect of war is always lurking, it is is a very rare occurrence to actually see the battles that go down. In fact, in nearly 40 episodes, we’ve only seen one true battle — the epic Battle of Blackwater Bay, when Stannis nearly sacked King’s Landing. So, when we do see battle, it is a rare, and generally massive experience. And all the more so when the battle has been building up for such a long period of time. In this case, the progression of the Wildling siege on the Wall has been developing for dozens of episodes — dating all the way back to early last season when Jon Snow infiltrated the Wildlings to learn of their plans. Compared to how immersed we are in other plot-lines, perhaps we felt removed from the build-up of this battle, probably due to the fact that this entire season we have not seen or heard from Mance Rayder or the army he has been uniting. Yet, episode after episode we were reminded that war was coming as the Wildlings inched closer to the Wall. And tonight, the multi-season development of the Wildling attack on the Wall reached climax and quickly became very real. But, beyond the rarity of actually seeing a battle scene in this world, and beyond that this battle had been building up for so long, this episode was meaningful for more profound reasons. As with most everything in this world, the significance of this battle was not the battle itself — but rather the ways in which each character was exposed by the battle. Whether revealing men as cowards or providing them a platform to become heroes; whether demonstrating a man’s purpose or taking from them the person they love — this battle provided a lens through which we were able to see deeper into the soles of each character. IN THE FACE OF DEATH, WHO WILL WE BECOME? Most of us will never face imminent death. But what if we were faced with the prospect of realizing that death was so likely and so close for us, how would we react? Who would we become? Death is the great revealer and for the brothers of the Night’s Watch who faced imminent death, these were questions they were forced to answer. And, in the face of death, we saw who each man became — we saw the truth of each character. And therein lies the magic of this episode. Men like Jon Snow proved their heroism and bravery — the prospect of death was unimportant compared to the duty of protecting the Wall. Fear was not an option and Jon took lead from atop the Wall as he shouted out his first commands. And when it was time to join the fight at the bottom of the Wall, we saw just how skilled a warrior he has become, taking down many Wildlings including Styr. 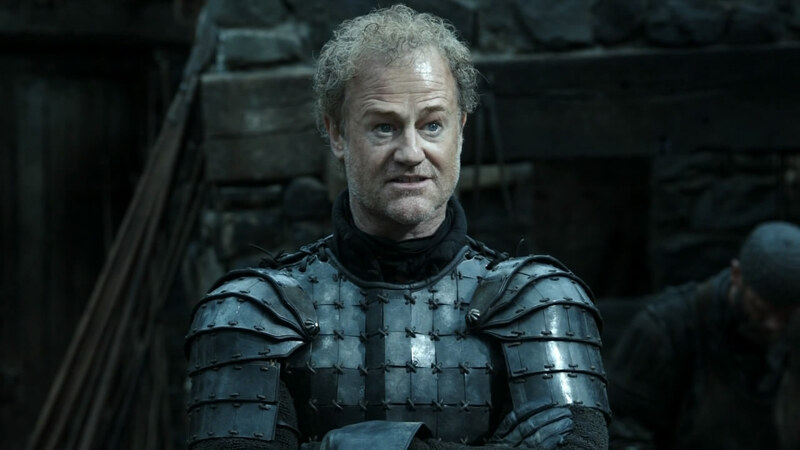 Ser Alliser Thorne was another of the episode’s heroes, proving himself a worthy commander of the Night’s Watch, at least in battle. As unlikable of a character as he has been, perspective is offered in an episode like this and we see the truth of his character; we quickly forget about his unlikability and only care to respect him for his valor in leading the Night’s Watch and courageously fighting back in the face of death. He took the fight to the much larger Tormund Giantsbane, though he sustained a deadly wound before being dragged away. Grenn was another hero of the episode, serving Jon Snow loyally and obeying his orders to protect the inner gate. Facing down a giant, Grenn quelled the fears of his brothers and kept them united to fight. And though we do not see the fight scene, we learn that Grenn and the others fought valiantly and gave their lives to protect the gate, while also succeeding in killing the giant. In the face of death, when everything else was stripped away, we saw true greatness in the soles of these men. On the other hand, we saw the ways in which certain characters were completely crippled by the fear that overtook them. Truly believing that death was so close for him, Pip was unable to fight, and as result, he took one of Ygritte’s arrows to the throat before dying in Samwell’s arms. Even worse, Ser Janos Slynt, a man who was once Lord Commander of the Kingsguard, completely deserted the fight and took cover behind a locked door. He abandoned his vows and his brothers, showing the truth of what he was made of. For nearly two seasons, we have been hearing about the Wildling army that Mance Rayder has assembled. And we finally got to see it, or rather a small portion of it. We see the giants that Mance was able to get to fight for him and the giant mammoths that they ride. To unite over 90 clans of Wildlings to fight together as one united army is something that nobody has ever been able to do before Mance Rayder. We are reminded of the dialogue last season when Jon Snow asked Mance how he did it, to which he responded, “I told them we would all die if we didn’t get south. It’s the truth.” So, while this battle for the Night’s Watch was about fighting back the Wildlings, for the Wildlings, it’s not really about fighting the Night’s Watch, but rather doing what is necessary to get out of the North. That Mance was able to unite all the Wildlings of the North in their quest to march south is an alarming reminder that Winter is Coming and perhaps the threat of imminent death is coming on a much larger scale. Another layer to the episode that was particularly gripping was getting to actually see the reality of being The Watchers on the Wall — the absolute last hope and line of defense between the Seven Kingdoms and all the threats that lurk north of the Wall. It was amazing to see the intricacies of the top of the Wall — intricacies that were built by Brandon Stark over 8,000 years ago, using the help of giants and the magic of the Children of the Forest. It was equally special to actually witness the way the Night’s Watch defends the Wall, using tactics and strategies that have been practiced for thousands of years. Prior to this episode, we had understood that this Wall was a defense structure and that the Night’s Watch defends the wall, but we had no idea exactly how the Wall was constructed, especially atop, or the way the Night’s Watch actually protects the Wall. We finally got to see the Night’s Watch defend the Wall from the rare position of being 700 feet in the sky. Even in an action-packed episode depicting a bloody battle, love finds its way in. Samwell is discovered reading about the Wildlings, fearful of what they have done to Gilly after they raided the brothel in Mole’s Town where she had been staying. Maestar Aemon tells Samwell that “Love is the death of duty,” suggesting that one cannot love a woman and also be dutiful to the Night’s Watch. Maestar Aemon goes on to speak of a girl that he once loved and the vision of her that he still holds on to. As a man who cannot see the world around him, Maestar Aemon tells Samwell that the visual memory of the girl he once loved is in fact more real to him than is Samwell. Maestar Aemon also re-reveals that he is a Targaryen and that he was next in line to be a Targaryen king, yet he passed to become a maestar. Though this had been subtly revealed to viewers already, most were probably unaware that he was a Targaryen. Maestar Aemon was the uncle of the Mad King and is great uncle to Khaleesi, but he is so old and has been so far away at the Wall for so many years that most are completely unaware that he is a living Targaryen. For viewers, previously, it was thought that Khaleesi was the last living Targaryen — it is interesting to consider the potential implications of the reveal that she in fact has a great uncle alive on Westeros. Unlike Samwell who at moments chose love over duty, Jon Snow has chosen duty over love. Sadly, Ygritte has chosen love over duty, and for this love, she gives her life. Despite all her talk of killing Jon Snow, when faced with the opportunity, she was unable to kill the man she loved. And with the kind of irony that can only be found in the Thrones world, we see that the arrow that kills her is shot by Olly, the unlikeliest of people — the young boy who had picked up a weapon on Samwell’s recommendation. And as Jon Snow holds the woman he loves and she takes her last dying breaths, the entire scene makes a powerful shift from a massive battle being fought by hundreds, to the world of just two people. We are brought into Jon’s consciousness as everything around him is faded out and we must watch the sadly beautiful scene of him holding the woman he loves as she dies in his arms, telling him that she wished they just stayed in the cave. In the aftermath of this bloody battle, we see just how undermanned the Night’s Watch truly is, and how unprepared they are to fight back the Wildling army. Once a great and powerful order, at the time of its formation, the Watch is said to have had 10,000 men that manned 19 castles along the Wall. Today, their numbers have dwindled down to less than 100. Though the Wall was built after the Long Night, over the next 8,000 years, the White Walkers never really came. Over time, people began to doubt the true existence of the White Walkers and the danger of their threat. The Long Night became more myth than truth and the Night’s Watch found themselves defending the realm from Wilding raids, rather than a White Walker invasion. The Seven Kingdoms began to forget the true purpose and importance of the Watch and they received less and less support each year from the rest of Westeros. And now, today, the Night’s Watch, with less than 100 men, is tasked with keeping out the Wildling army of over 100,000. Jon Snow tells Samwell that Mance Rayder was merely testing their defenses and that they have no chance at defeating the Wildlings, who will attack again at nightfall. Jon Snow leaves the Wall to seek out Mance Rayder, as he believes this is the only chance of defeating the Wildlings. Before he leaves, he gives his sword, Longclaw, to Samwell for safekeeping.Where he is going, his sword will do him no good, and he wants to protect the family sword given to him by Lord Commander Mormont.With Jon Snow gone and Ser Alliser badly wounded, who will take leadership of the Night’s Watch? And what is even left to lead? Ser Alliser Thorne became acting Lord Commander of the Night’s Watch after the murder of Lord Commander Mormont. Prior to this, he was master-at-arms, responsible for training the brother’s of the Night’s Watch. Before joining the Night’s Watch, Ser Alliser was a knight of House Thorne, a house that sided with the Targaryens during Robert’s Rebellion and fought to defend King’s Landing against the rebels. After the Mad King was defeated and King’s Landing fell to the rebels, Lord Tywin gave Ser Alliser two options: death or to join the Night’s Watch. He chose the latter and has been a bitter and vengeful man ever since.